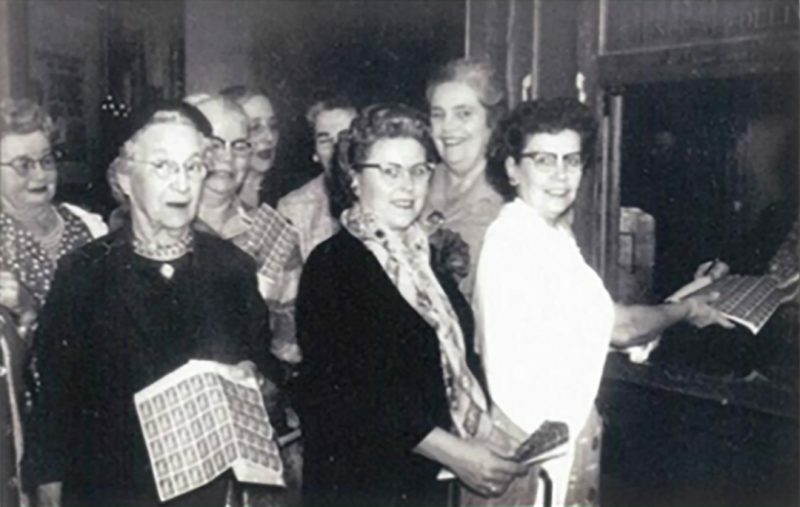 The first meeting of the Folsom Neighborhood Garden Club was held on January 11, 1934, when Eleanor Sanborn organized the meeting. She was elected to serve as the first president. There were sixteen charter members. Dues were 50 cents a year and members met in homes on the first Thursday of the month. Tea was served and members brought flower arrangements to be judged. The love of gardening was encouraged and members became involved in civic beautification projects. The club designated the azalea to be the official flower of Folsom and the crepe myrtle to be the official tree. In 1951, membership reached 77 for the first time. Lupine and poppies were planted at Folsom Dam for the grand opening. In 1961 the club’s name was changed to Folsom Garden Club and the first redwood trees were planted at Lembi Park on Arbor Day. In 1968 the first fashion show was held with the theme “Easter Parade” and members modeled Easter outfits. Through the years civic projects were undertaken, including the establishment of the Folsom Garden Club Park at Natoma and Sibley Streets. 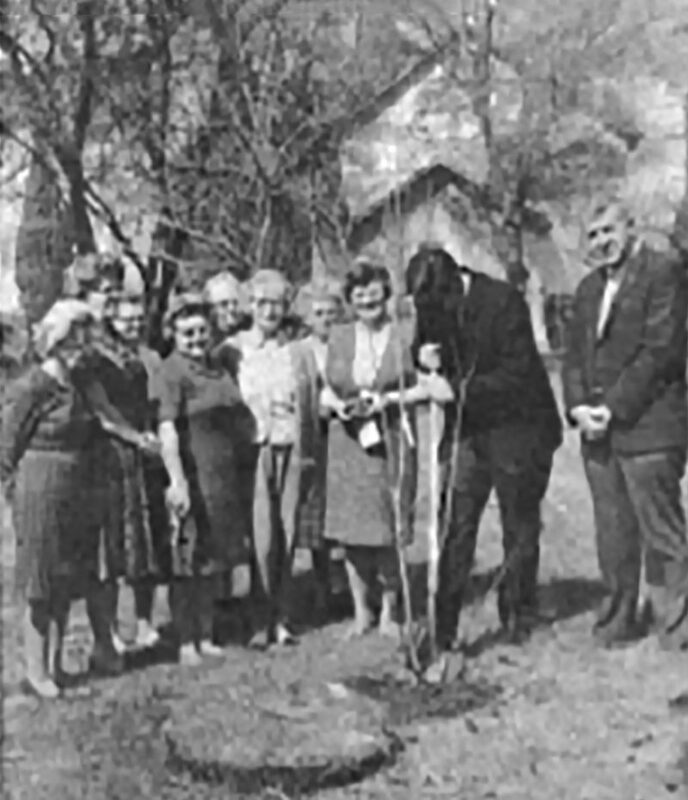 The photo on the right was taken on Arbor Day 1966 in the new Folsom Garden Club City Park. In the 1980’s and 1990’s the club began contributing to “Penny Pines” and “Save the Redwoods” and world gardening projects. The Blue Star marker was put in the FGC Rose Garden. For Folsom’s Centennial Celebration in 1996, members landscaped the area in front of Civic Center where a time capsule was placed. In 1997 the Club became involved in maintaining the gardens of the Murer House. In 2001 the first FGC Garden Tour was held on June 10th and called “Sunday in the Garden.” Tickets were $5 for the tour of 5 gardens, including the historic Murer House. The first male members joined the club in 2001 and in 2003 the first Garden Club newsletter, “The Garden Spot” was issued. The 75th Anniversary year of celebration was celebrated in October of 2009 with a party that included guest speakers from the city and other garden clubs. An anniversary arbor was installed and included a dedication. Dues were increased to $25 per member. Four $1,000 scholarships were awarded in 2010, the most ever for the club. The club continues to be the oldest community service organization in Folsom.